Think you know how to spot red flags when you’re shopping open houses? Given the proliferation of home stagers, it can be difficult to see beyond the best features they choose to highlight. If you have a short list of red flags to look for, though, you can see past the artfully arranged furniture and décor to see what isn’t highlighted. So, I hope you didn’t wear your nice shoes on this open house tour because if you really want to spot the red flags as a potential home buyer, they’re going to get dirty. Does the paint on any wood elements such as doors, door frames, or window frames look fresh, and yet, something looks a little…off? If it looks like it isn’t just a bad paint job, it may be that it’s a fresh coat of paint to cover up peeling paint, and peeling paint is an indication of dry rot and general poor home maintenance. If there’s a concern about dry rot or any concern with wood for that matter, ask to see the termite bond for the home. A termite bond should feature regular inspections, and in most cases, an annual inspection. Are there one too many rugs in an area? There’s probably a reason for that. Go ahead and peek underneath; you may find that they’re simply concealing a small discoloration in the wood, which is not a big deal, particularly if you can simply cover it with a rug yourself. However, if you find that the rugs are concealing large stains, that could indicate water damage, which could suggest anything from plumbing problems to structural problems. Never underestimate a small leak. Take this from someone who overlooked a warning about a minor leak and ended up gutting and replacing two bathrooms. It’s expensive. Don’t get us wrong, we absolutely advocate for making your home smell warm and welcoming when you host your open house, but it shouldn’t be overboard. If it seems to you that the real estate agent put out just a few too many flowers and candles in the house you’re touring, you may want to consider what scent she is trying to conceal. If it’s a damp, musky scent, that could indicate mold. Other strong scents include cat odors, which are incredibly difficult to remove from a property. In this situation, ask for another showing of the property, but this time, minus the scents. Cracks in the exterior may suggest foundation problems, and if you read the post Why You Need a Home Inspection, you’ll learn why overlooking cracks in the wall may cost you $100,000 or more in out-of-pocket repairs, as it did for one former service member. Homeowner’s insurance won’t cover this kind of damage, and that’s just not a pretty way to part with your savings or retirement plan. Here’s where you’ll get dirty. Poor drainage can also cause foundation problems. To check for this, first, inspect the exterior ground edge of the property. Notice if pipes look like they’re in place (it’ll be quite obvious if they aren’t), and see if the ground appears unusually soggy, particularly in the areas where pipes meet the ground. Second, walk the grass. Do any pockets of grass squelch more than others? Third, look at the general level of the land gradation relative to the home. Need help spotting more red flags? 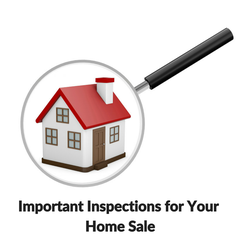 Download Important Inspections for Your Home Sale!